The inspiration for the title comes from the Greenwich Flying Squadron facebook page where photo entries for the night refer to chaos. It was indeed chaotic both on the way out and on the way back in so full marks to Avalon for another fastest and a second on handicap. 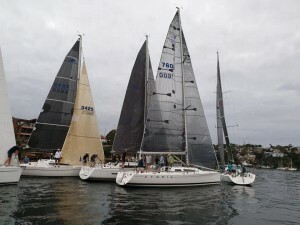 We were hard on the transom of Jackpot who was second fastest but we were forced to tack away by port tackers coming off the Onion Point shore and refusing to tack back. The two tacks we made away from our right of way tack cost us eight minutes and from the photos of the mayhem Utopia was disadvantaged even more and trailed us across the line. Both from the video from the deck of Aetos and from Jeff Lewis’ posts the setback to Utopia is very evident. Our 5th fastest could have been better but for being on the wrong side of a shift at Goat Island and for the port tackers in Humbug but we salvaged a 5th on handicap for the penultimate race of the season. 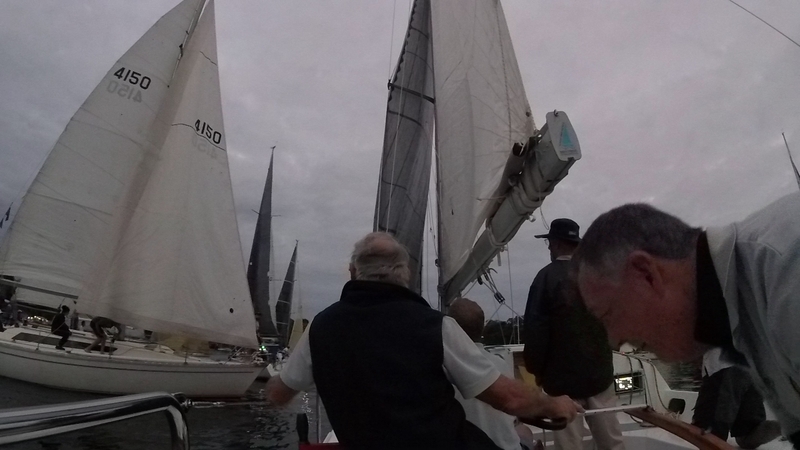 We made a clear start at the club end of the line and only Avalon was quicker into Humbug but there we were both overrun by yachts squeezing between the moored yachts and the right of way yachts ahead. Avalon conceded we could not give them their right because of the yachts overrunning us from behind and we both went low and away from the new breeze. From memory Jackpot, Meridian and Utopia managed to get their noses in front while Avalon below went the long way around but sailed into stronger winds quite promptly. We were just nosing ahead of Joli and holding our own but we both had some catching to do. The big Ausreo had drifted through Humbug well and was ahead of both of us while Much Ado V was just to leeward. For most of the work to Goat Island we sailed well picking off first Ausreo and later Joli but on the approach to Goat Island Much Ado V tacked on top of us and while we were pinned down on the northern shore the Goat Island shore paid off well for Ausreo and Joli. 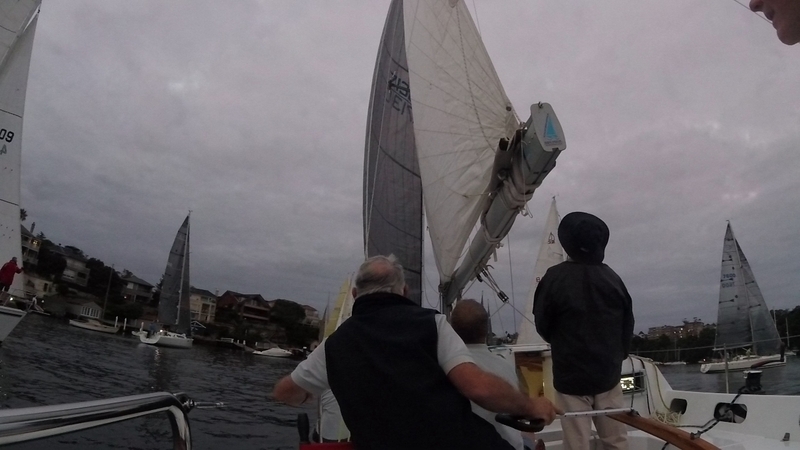 Our phasing with the wind was not ideal and we ended up pinching slowly to clear the eastern end of Goat Island. Around Goat Island we picked a middle line and sailed around Much Ado V who were caught in wind shadow and sailed over Ausreo. The final throw of the dice was in Humbug. Much Ado V had caught us on the run to Humbug but went in too close and died in the doldrums. 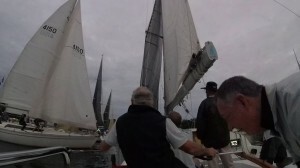 We went wide and lined up Jackpot, sailed up to Meridian and had Joli down to leeward. Utopia had already tacked away from the chaos along the Onion Point shore and was becalmed mid stream. Some how Jackpot just passed ahead of the port tackers while we were forced to tack away leaving Meridian and Joli to sneak past the port tackers sterns. That gave Jackpot a big break and a first on handicap while Avalon hung on for second on handicap. We had been fortunate to catch up to the fleet but could not make the four boat lengths we need to clear the impenetrable row of port tackers. 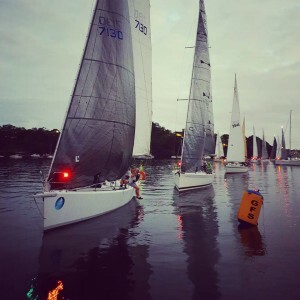 Utopia tried to make up ground from the nine minutes she had lost to Avalon but we were both caught in a very light phase and had the fleet coming up from behind with breeze so Lisdillon took third and Fireball fourth on handicap. That left Passion X on fifth with one more throw of the dice next week.